Highway 101 in Santa Barbara County reopened Sunday, nearly two weeks after a massive mudslide in Montecito closed the busy roadway. The highway, a key north-south route in California that carries about 100,000 vehicles through the Central Coast each day, was shut down after the roadway was covered by twelve feet of mud and debris following the deadly Jan. 9mudslide. Officials had promised the roadway would be reopened in time for the Monday morning commute. On its Twitter page Sunday, the California Department of Transportation announced the reopening shortly after noon. Motorists should be aware, however, that there will still be some lane closures in the coming days as maintenance and construction crews continue repair work, Shivers said. The highway was blocked by a large pile of rock and soil, the worst of which accumulated in a quarter-mile section at the Olive Mill Road interchange in Montecito. As one of the lowest points in the city, it proved difficult to clear. Once the roadway was cleared, the pavement and overpasses had to be evaluated for structural safety, and then signs and guardrails reinstalled and lines repainted, officials said. Dozens of Caltrans crew members, aided by private contractors and the Army Corps of Engineers, worked around the clock on the road project, and are still working on clearing the drainage system, Caltrans officials said earlier Sunday. Off-ramps in both directions of the “recovery zone” will stay closed, officials said, but the on-ramps will be open. It was not clear how long the off-ramps would remain closed. 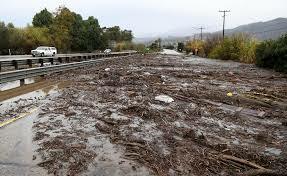 The massive mudslide turned Santa Barbara County’s fire-ravaged hillsides into rivers of mud, trees and boulders that destroyed more than 100 homes in its path. On Saturday, a rescue crew combing through debris in Montecito with the help of a dog found the body of 28-year-old Fabiola Benitez Calderon, raising the death toll from the mudslide to 21, officials said. Benitez Calderon is the fourth member of her family to die in the slide, which was triggered by heavy rain on hillsides destabilized by the Thomas wildfire, the largest recorded in California. The bodies of her 10-year-old son, Jonathan Benitez; Jonathan’s 3-year-old cousin, KailyBenitez; and Kaily’s mother, 27-year-old Marilyn Ramos, had already been found. Hours after the slide, a fifth member of the family, 2-year-old Ian Benitez, was found with his clothes torn off, caked in mud, but alive, nearly a mile from where he had last been seen. Ian’s father, Victor Benitez, was also injured in the slide. Two people remain missing, according to the Santa Barbara County Sheriff’s Department, 2-year-old Lydia Sutthithepaand 17-year-old Jack Cantin.